The 53rd and penultimate book in the epic Horus Heresy series and the brave soldiers of the Emperor attempt to hold back the armies of chaos from reaching Terra. The line is drawn on Beta-Garmon and god-machines of the Adeptus Titanicus are at the front. Horus has defeated all that have stood before him, even the Emperor's own Executioner - the Primarch of the Space Wolves Leman Russ. There only remains on more book after this one in Black Libraries momentous Horus Heresy series - The Buried Dagger (review coming soon). Then it's another, shorter series that will deal with the actual battle for Terra and presumably ending with the Emperor's epic fight with Horus. Before that though we've got an epic, cataclysmic battle of where the enormous machines of the Adeptus Titanicus fight it out. The question is, how do you tell the story of such a large scale battle without it becoming just a blow-by-blow commentary? Guy Haley's answer is to focus the story on the escalating battle between the loyalist Adeptus Titanicus legion of the Imperial Hunters (Legio Titanicus Solaria) against the Traitorous Death Stalkers (Legio Titanicus Vulpa). As many fans will know, this isn't just a fight between two sides but a much more personal grudge-match with a lot of history between the two opposing forces. For those looking for a 400 page pitched battle, you will be disappointed. it's only really the last third of the book where things get that heated, before that there is a big build up exploring the lives of the people inside the vast machines. Having said that, It's an interesting journey - a microcosmic look within a macrocosmic event that still manages to evoke the vast power and scale at play. When we do get to the siege of Nyrcon City - the event known as Titan Death due to the sheer number of Titans destroyed - Haley does a wonderful job of describing such an epic event. The Titan on Titan battles are all you could wish for and worth reading the book for alone. 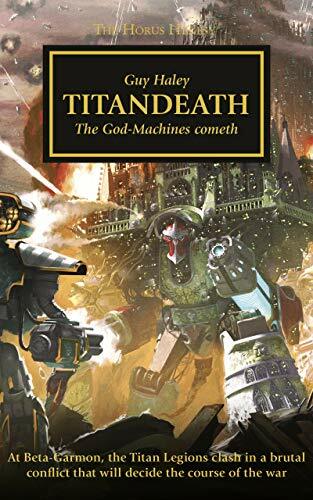 Titan Death is a much more interesting book than I thought it would be and I applaud the authors decision to focus on one area of the Beta-Garmon battle. It's a rewarding, insightful journey describing a part of the Warhammer 40k universe that has been criminally overlooked so far. Written on 18th March 2019 by Ant.